Recently, Cam Newton and Under Armour signed the deal for a new line of shoes – and now they are ready to hit the field. Cam Newton is certainly among the most successful and talented young quarterbacks to play in the NFL and therefore many football fans are interested in stay updated about his professional, business and personal success – on the field and beyond it. Also known as the UA Highlight Cleats, these football shoes feature the signature of UA, CompFit ankle sleeve providing snug and lightweight supports which allow the wearer to stay mobile and quick. Cam Newton’s new line of football cleats will possibly be accompanied by athletic gear and Newton’s signature shoe line. 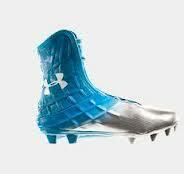 When it comes to UA Cam Highlight MC Youth Football Cleats, they also have TPU plate (lightweight molded) and secondary cleats delivering superior traction on various surfaces, especially synthetic ones. This allows the players to explode up field. We all know that for football cleats, as well as for the other footwear, comfort is the king; besides incredible performance Cam Newton Cleats have EVA foot bed which will certainly provide durability and ultimate comfort. To cut a long story short, it’s really hard to find a pair of football cleats that are so streamlined and lightweight, but still providing the stability and support players need for a quick and successful game. What’s the cost? Even though Cam Newton cleats present the high-quality sports footwear, their price is not so outrageous. In fact, to most of sport enthusiasts and fans, Cam Newton cleats are very likely to be affordable. We are looking forward to Cam Newton’s new signature line possibly coming by the end of 2013. As we can see, this athlete is in top form and on his way to amazing success, and we love when sports and fashion clash – in the most creative and constructive way.